One gull was taking a breather atop the light, but dozens of others were circling the Albany Fred Meyer parking lot the other night. And some were swooping menacingly low. So, naturally I thought of Tippi Hedren. Gulls are nothing unusual in the valley, especially in winter. They mostly live along the coast, sure, but they also migrate. And maybe this flock — I think they were glaucous-winged gulls — was on its way somewhere. This was before the start of the recent valley winter storm, and maybe they got wind of the forecast and were preparing to get away. Gulls, I read when I looked it up, prefer open areas where there’s a good chance of getting something to eat. That evidently includes shopping center parking lots, especially if there’s a burger joint nearby. Although in this case, after a lot of circling and swooping, much of the flock seemed to light on the roof of Bi-Mart across Clay Street. It’s hard to imagine what they hoped to find to eat there. 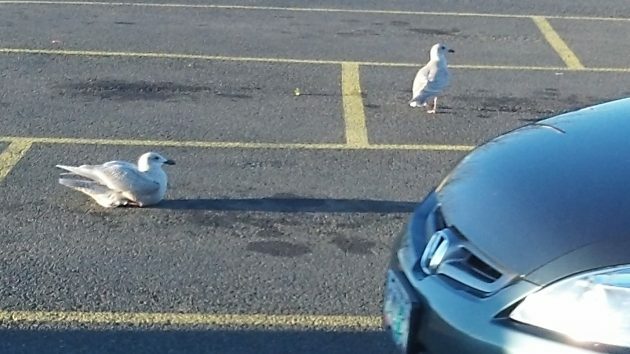 These gulls were occupying Albany parking spaces in January 2015. Let’s not forget the elephants, Tippi! All of us for that matter. Your expose’ on Albany’s gull situation is metaphorical in one sense. If we think of the city council as chief protagonists in the Lower Mid-Valley Rime of the Ancient Mariner and how they were finally able to unburden themselves of the foul-smelling cannabis albatross that had taken up residence round their collective neck. It had to be a primal release, not unlike Tippi Hedren when she eventually decided she need not suffer Hitchcock’s brutishness. All things are connected.